What Else Can I Expect From an Online Master's in Human Resources Program? Whether you want to advance your career in human resources or transition into HR for the first time, earning your online master's in human resources can help you achieve your goals. The right degree can literally pay off -- workers with a master's degree in human resources earn almost $20,000 a year more than those who only hold a bachelor's degree. Human resources is a professional field dedicated to ensuring safety, fair treatment, and compensation for employees at work. As an HR professional, you can find work in many industries and may be employed by private companies, government agencies, or nonprofit organizations. You are responsible for planning, directing, and managing various administrative functions. Day-to-day duties may include interviewing and hiring job candidates, developing training programs for new employees, and acting as a liaison between workers and management. Most master's-level HR programs belong to one of two categories: a master of science (MS), which is focused on technical and career-related subjects; or a master of arts (MA), which incorporates liberal arts studies into the curriculum. The coursework for an MS or MA in human resources will explore in-depth topics like leadership and management, ethics, communication and technology, as well as finance, business law, and other key aspects of the corporate sector. Most master's programs end in a capstone project, which may take the form of a thesis, a research paper, or an internship. If you want to advance in the competitive field of HR and enjoy higher earning potential, a master's in human resources online can help you. Explore our comprehensive guide below to learn more about what you can do with a master's degree in this dynamic career. WILL AN ONLINE MASTER'S IN HUMAN RESOURCES PROGRAM PROVIDE ME WITH THE SKILLS I NEED TO ADVANCE MY HR CAREER? The Bureau of Labor Statistics (BLS) notes that a bachelor's degree will be sufficient for most human resources roles, including HR managers, HR specialists, and compensation and benefits managers. By earning a master's degree in HR, you'll set yourself apart from other candidates and increase your value in the workforce. Additionally, you'll be eligible for positions that are normally reserved for applicants with an advanced degree, such as upper-level managerial roles. WILL EARNING A HUMAN RESOURCES MASTER'S DEGREE ONLINE WORK WITH MY SCHEDULE? Web-based coursework is a convenient alternative to classroom learning. Students can access course lectures and readings, submit written assignments, take exams, and communicate with their professors any time of day from home. Current technology also enables them to study with laptops, tablets, and smartphones. Most master's in HR degree programs include optional internships for students to gain supervised, hands-on experience before entering the workforce. Online students usually work with school officials to arrange internships close to home. WHAT JOBS CAN I GET WITH MY MASTER'S IN HUMAN RESOURCES? The field of human resource management is constantly changing due to an expanding global business environment and rapidly evolving technology. As organizations grow and change, well-trained HR professionals will be in high demand. As a master's in human resources graduate, you'll be well-qualified for most entry-level positions and some managerial roles. A degree specialization and internship will boost your standing even further. However, post-degree professional experience may be a prerequisite for some jobs. For example, BLS notes that many HR managers begin their careers as HR specialists or labor specialists, advancing after several years of experience. 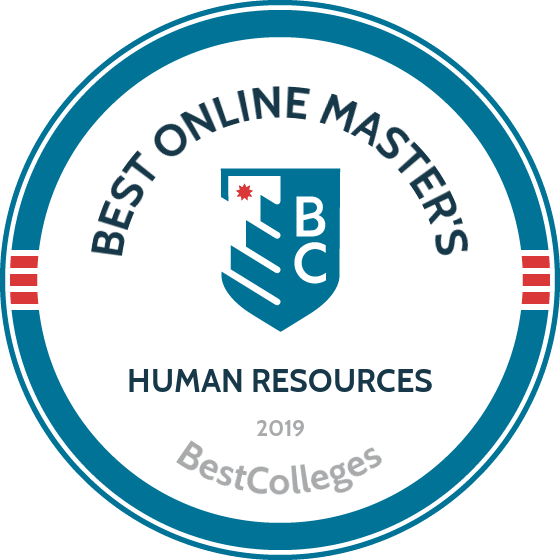 WHAT ARE THE BEST ONLINE MASTER'S IN HUMAN RESOURCES PROGRAMS? The best online HR master's programs equip you with the interpersonal skills and workplace knowledge you'll need to not only attain a solid entry-level position but also launch a successful career in human resources. The following list of schools can serve as a starting point in your search for the best online master's in HR programs. We encourage you to explore the learning outcomes, educational services, specialization and internship opportunities, graduation rates, and other key offerings at all of your target schools. Dedicated research will ensure you select the best HR master's program to fit your career goals. Columbia University is a private research university based in New York City. As an Ivy League, CU serves undergraduate and graduate students through 69 academic departments. The university's School of Professional Studies offers an online MS in human capital management. The 36-credit human capital management program emphasizes effective strategies for talent acquisition, development, and retention. Students take nine core courses across two foundational HR areas: human capital management and business partnership. Human capital management classes cover topics such as human capital theory, employment law, and technology's role in human resources. Business partnership courses teach students about consulting, organizational strategy, analytics, and finance. Students choose two electives in topics such as global organization management, strategic workforce planning, and business transformation. During a capstone project, students draw on previous coursework to propose a solution to a real human capital management issue. Learners write a 7,000-8,000-word paper and prepare a presentation. Students can complete the entire curriculum online. Part-time learners typically earn the degree in six terms, while full-time students can graduate in as few as three terms. CU's program is designed for human resources professionals with 3-6 years of experience in the field, but the university accepts students with less experience. Applicants with fewer than three years of professional experience must submit GRE or GMAT scores. Applicants must submit a statement of academic purpose and a supplemental essay. Most admitted students hold at least a 3.0 undergraduate GPA. Founded in 1789, Georgetown University is the oldest Catholic and Jesuit university in the United States. The school offers undergraduate, graduate, and professional degrees through nine schools, including an online master of professional studies in human resources management. The 33-credit human resources curriculum comprises two core courses, three foundation courses, and six electives. Basic coursework explores workplace ethics, human capital analytics, and research methods. Through electives, students can pursue one of five focus areas, including diversity and inclusion management, international human resources management, and human capital development. In a required capstone course, students address a problem in an organization. They work with an adviser to analyze the issue and present a solution to the sponsoring company. Students in the capstone course develop a research proposal, review literature, and identify effective research methods. The online HR master's program stresses experiential learning; throughout their coursework, learners analyze case studies and examine practical business scenarios. Additionally, human resources students gain hands-on experience through client meetings and events with prominent organizations. Georgetown delivers the program entirely online through asynchronous courses. Students can also combine online and on-campus classes. Learners can begin the program in fall, spring, or summer, and they can study full time or part time. Full-time students take 2-3 courses each semester, while part-time learners take 1-2 courses per term. Most students complete the program in 2-5 years. Virginia International University, a private nonprofit institution based in Fairfax, offers more than 20 online programs at the bachelor's, master's, and graduate certificate levels. VIU offers an online MBA with 15 concentrations, including human resources management. The MBA in human resources program comprises 36 credits, including seven core courses that build fundamental management skills and knowledge. Students complete core classes in managerial communication, cost management, and organizational behavior. Learners also take three concentration courses; human resources students can choose classes such as conflict resolution and compensation and benefits. MBA students can choose one elective from any concentration. The program culminates with a required MBA integration course, which prepares students for the business world. During the three-credit class, students solve complex business issues in local Virginia and Washington, D.C. organizations. VIU delivers online courses in eight-week sessions, and students can enroll in courses six times per year. Students complete the MBA completely online through synchronous and asynchronous coursework. Learners study independently and regularly meet with professors and their cohort in real time. Distance learners can complete the master's degree as quickly as one year. Applicants must hold at least a 2.5 GPA. Students without an undergraduate degree in business may need to take up to five prerequisite courses in areas such as finance, accounting, economics, and statistics. Admitted students can transfer up to 50% of required credits. Established in 1867, the University of Illinois Urbana-Champaign offers more than 90 online programs and more than 1,700 online courses. Education students at UI can choose from 11 online programs, including a master of education in human resource development. The online master's in human resources covers basic topics in performance improvement, employee training, and organization development. Since the eight-course program prepares students to plan and oversee professional development programs, the curriculum emphasizes education theory and incorporates some human resources coursework. A course on learning technologies teaches students about the business applications of popular instructional tools. Educational psychology coursework explores adult learning theory and human development. Students can choose from electives, including diversity in the workplace, strategic human resource development, and training system design. Students can complete the entire 32-credit curriculum online through a combination of asynchronous and synchronous study. Learners attend mandatory live class sessions that typically take place in the evenings. They also participate in asynchronous forums and group projects. Distance graduate students typically take two courses per term and earn their degree in 18-24 months. Distance students at UI have access to online resources, including library research support and writing, grammar, and language guides. Colorado State University, a public research university in Fort Collins, offers extensive online options through its online division, CSU Global. The school offers 12 graduate degrees, including a master's degree in human resource management that holds accreditation from the Accreditation Council for Business Schools and Programs. CSU Global designed the program's 36-credit curriculum to meet the standards of the Society for Human Resource Management. During a class on maximizing human capital, students explore organizational strategies and training programs to maximize workers' potential. A course in strategic labor relations explores the relationships between organizations, unions, and employees. Through a capstone project, students demonstrate their knowledge of human resources concepts, including labor management, and business and legal issues. Students can complete an optional human resource management internship to gain practical experience in the field. During the 80-hour internship, students work under the supervision of a senior-level human resources worker at a department-approved organization. Students can further customize the program by pursuing one of 19 specializations, such as strategic innovation, applied business management, or global management. Aside from the internship, learners complete the entire master's in human resource management online through asynchronous classes. CSU Global provides online resources including 24/7 tutoring in every subject and access to librarians who can help students find resources and plan research. The school's career services center helps students build their resumes and look for jobs. Founded in 1831, New York University enrolls more than 50,000 students and is one of the largest private institutions in the country. NYU offers 24 online programs, including an MS in human resource management and development. The 42-credit curriculum comprises eight core courses, four concentration classes, an elective, and a capstone. Core coursework covers basic business concepts related to finance, business strategy, and global economics. A core course in information technology examines the role of computer systems in decision-making, strategy, and overall business operations. Human resources students can pursue a concentration in global talent management; human resources management; organizational effectiveness; or learning, development, and executive coaching. Some unique concentration courses explore succession management, the future of human resource management, and talent assessment. All human resources students take a course on research process and methodology to learn skills in data collection, research design, and data analysis. Students fulfil the capstone requirement through a master's thesis or a final project. Non-thesis students participate in a human resource management simulation, during which teams of students manage a business or nonprofit organization. Learners experiment with key variables including wages, hiring practices, and employee training to help their simulated company succeed. NYU delivers the human resources program on campus, online, and in a hybrid format. Online students view live lectures each week, typically in the evenings. Distance learners also participate in asynchronous group projects and discussions. Based in Ithaca, New York, Cornell University is a private institution and an Ivy League. Cornell's School of Industrial and Labor Relations offers an executive master of human resource management designed for experienced human resources professionals. The program examines human resources strategies at a high level and covers topics including influencing senior leaders, internal consulting, and strategic positioning in markets. Cornell delivers the executive master of human resource management in a cohort-based, hybrid format. Students complete coursework primarily online, through discussions and chat sessions. Learners also travel to campus for three week residencies that cover topics such as labor relations strategy, comparative employment relations, and negotiations. During on-campus sessions, students work with their cohort and meet individually with professors. Students complete the 30-credit program in 15 months. Learners work on a case project throughout the program. Over four terms, students complete several phases of the case project while consulting with faculty members and classmates. Students identify an HR issue in their organization, identify challenges, and develop a solution. At the end of the program, learners draft a final report and present their case project. Cornell prefers applicants with at least eight years of human resources experience. Applicants submit a resume, transcripts, letters of recommendation, and a statement of purpose. Prospective students also describe a potential human resources project and record an interview video. Golden Gate University is a private, nonprofit institution and offers online graduate programs in disciplines including business, information technology, and public administration. GGU's online MS in human resources management requires 27 credits. Core coursework includes a class in workforce trends that covers the history and evolution of work in the United States. A course in HR data and performance metrics teaches students to track, measure, and analyze employee performance. Students can complete the entire HR master's online and asynchronously. Students can also earn GGU's MS in human resources management in a hybrid, cohort-based format. Students in the hybrid program attend in-person classes every other Saturday, progress through the program with a cohort of up to 25 classmates, and can earn the degree in one year. GGU provides online student services including a technology help desk. Distance learners can also access online tutoring from GGU instructors and tutors with master's degrees. The university's career services department provides resources, such as job postings and a list of networking events. Applicants must demonstrate basic knowledge of U.S. business practices through an undergraduate business degree, two years of full-time professional experience, or completion of a fundamentals of business course. GGU does not require most applicants to submit standardized test scores; however, those who do not demonstrate adequate academic preparation may need to submit GRE or GMAT scores. Established in 1880, the University of Southern California is the oldest private research university in the state. Based in Los Angeles, the school offers more than 400 graduate programs through a liberal arts college and 19 professional schools. USC boasts more than 80 online graduate programs, including an MS in human resource management. Human resources students take 12 two-credit courses. Courses include classes like anticipating the future of HR, which examines emerging trends and future problems in human resources management. A course on organizational culture teaches students to build a company culture that fosters employee performance. Like students in many human resources master's programs, online learners at USC explore fundamental topics such as human resources leadership and strategy, in addition to modern subjects including diversity, corporate social responsibility, and data analytics. Students can complete the MS in human resource management entirely online, through a one-year or two-year track. Learners can begin the program in the fall, spring, or summer. USC offers online resources including a career center where distance learners can browse job openings; consult career guides; and access help with cover letters, resumes, and interviews. Through the library website, students can chat with a librarian and access digital academic resources. Applicants must submit official transcripts, a current resume, and letters of recommendation. Applicants must also supply a statement of purpose explaining their career aspirations and their reasons for choosing USC's human resources program. American University is a private research university based in Washington, D.C. The university offers 25 online graduate degrees and certificates in areas including international relations, legal studies, and business administration. AU's online MS in human resource analytics and management covers fundamental HR principles including benefits, employee engagement, and performance measurement. The program also emphasizes cutting-edge topics in HR technology and data analytics. A human resource information systems course explores tools and systems that HR workers use to track performance and store employee records. A class on data-driven decision-making teaches students quantitative and qualitative methods for collecting, analyzing, and representing company data. Students complete 30 credits, including eight required courses and one elective. At the end of the program, learners complete a capstone course where they apply knowledge of data, human resource management, and technology. During the capstone course, students construct a detailed business plan under the supervision of a professor. Online students who take two courses per semester can graduate in as few as 20 months. Online students can access tech support at all hours. Students begin the program with a virtual orientation that introduces them to the online learning platform. Distance learners can also access online financial aid counseling, student services advising, and library resources. Applicants must submit a statement of purpose, official transcripts, letters of recommendation, and a resume. Villanova University, founded in 1842, is a private research university based in Radnor Township, Pennsylvania. The university offers more than 100 bachelor's, master's, doctoral, and professional programs, including numerous online options. The online MS in human resource development consists of 36 credits from prerequisites, required courses, and electives. HR students can add a specialization by pursuing one of four graduate certificates. The HR leadership certificate builds management, communication, and financial skills. The organization development certificate prepares students to evaluate an organization's operations and implement broad changes. Students specializing in HR analytics and research learn to collect, interpret, and leverage data using the latest technologies, and learners who pursue the HR business partner certificate explore how HR departments support overall business goals. Students must satisfy a capstone requirement by passing either the Society for Human Resource Management exam or Villanova's comprehensive final human resources exam. Alternatively, students can complete an experiential capstone project involving an HR internship or a work project proposal. Villanova waives the capstone requirement for learners who already hold an approved professional certification. Applicants must submit three letters of recommendation, a resume, and a statement of goals. They must also submit a 500-word essay describing their work experience and career aspirations. Applicants without a minimum 3.0 GPA can demonstrate their academic preparedness through GRE or GMAT scores, prior graduate studies, or an HR industry certification. Founded in 1965, Florida International University is a public research institution based in Miami. FIU offers nearly 300 programs, including 66 fully online options. The online MS in human resource management boasts a curriculum that aligns with the Society for Human Resource Management's educational guidelines and templates. HR students receive a one-year membership to the society while pursuing their degree. The 38-credit curriculum consists of 14 courses, including a required class in wellness management, which explores strategies for maintaining physical and mental health in the workplace. Along with 12 three-credit classes, students take two one-credit professional development seminars. All learners complete a mandatory seminar in finance for HR professionals, which introduces common financial terms, tools, and documents. To satisfy the remaining professional development requirement, students can complete a career development class or a human resources internship. FIU delivers an online master's degree in human resources in a cohort format. Students can begin the program in the fall or spring, and learners take two online courses at a time during eight-week blocks. The program includes an optional on-campus residency that allows distance learners to network and participate in extra educational opportunities. Students who attend the on-campus session participate in a mock trial as part of their employment law course. Applicants must hold a minimum 3.0 GPA in upper-division undergraduate coursework. They must also have at least five years of work experience, with three years in a human resources role. Founded in 1915, Webster University is a nonprofit institution based in Missouri. The university offers well over 100 programs through four schools and colleges. Graduate learners can select from more than 50 graduate programs, including an online MA in human resources management. Human resources students must complete 36 credits to graduate. Learners take nine required courses that cover topics such as organizational behavior, labor-management relations, and basic finance. After completing all required classes, students complete a capstone course where they evaluate current research in human resources. The program features an asynchronous format with nine-week terms. Courses, however, do not offer a self-paced format, and learners must meet regular deadlines for lectures and assignments. While students can finish their degrees online, they may choose to enroll in online and on-campus courses. For a typical online class, students should prepare to spend 15-20 hours studying each week. Webster's distance learners can take advantage of many online student services. Through the Academic Resource Center, they can access academic counseling and tutoring. Students can also use the Online Writing Center for help writing, brainstorming, and revising. They submit papers electronically and receive detailed feedback within 2-3 business days. In addition, learners can conduct research and consult with librarians through the library website. Webster's master's program in human resources boasts accreditation from the Accreditation Council for Business Schools and Programs. Students looking to focus on business can opt for Webster's online MBA with a concentration in human resources management or human resources development. Founded in 1958, Brandman University focuses on serving learners through more than 25 campus locations and an online division. Brandman offers an MBA with concentration options in 10 areas including human resources. MBA in human resources students take 24-36 credits of core courses, depending on any course waivers they receive. Some notable core business classes cover topics like financial reporting, corporate responsibility, and business process analysis. Students also take 12 credits in the human resources emphasis. All human resources learners take two classes in workforce planning and talent management. They choose the remaining two human resources classes from a list of six options that cover areas like collective bargaining, negotiation, and human resources information systems. All MBA students also take a capstone class in business strategy and competitive advantage. Brandman offers many resources to distance learners. For instance, prospective students can ask for application help from Brandman's enrollment coaches. Online students may also set up virtual meetings with academic advisers to develop an education plan. The Online Writing and Math Center delivers synchronous and asynchronous tutoring through group and one-on-one sessions. Applicants must submit an application along with official transcripts and can fulfill admission requirements through a few paths. Applicants can qualify by holding a 3.0 undergraduate GPA in their last 30 credits of study. Students with a 2.5-2.99 GPA in their last 30 credits must also submit GRE, GMAT, or Miller Analogies Test results. Alternatively, applicants can hold a master's degree or submit a portfolio that proves their readiness for graduate work. Established in 1890, the University of Oklahoma is a large public university located just south of Oklahoma City. The school educates students online and through campus locations around the world. OU's Extended Campus, which delivers its online programs, offers a master's of human relations program with a concentration in human resources. Human relations incorporates three main areas of study: counseling, organizational studies, and social justice and change. In addition to core human relations coursework, students take human resources classes that deal with topics like employment law, diversity and inclusion, and compensation. OU administers the online HR master's program in a hybrid format. Students complete 36 credits and report to a campus for either a one-week residency or for two weekends. Online human relations learners can satisfy residency requirements at one of more than a dozen campus locations in the U.S. and Europe. Students can take accelerated courses and finish the master's degree in 16-24 months. Along with required coursework, all master of human relations students must complete an internship to gain practical business experience. The internship may be paid or unpaid, and students must log at least 75 hours in the workplace. Learners can split their internship between multiple companies, and many students choose to complete the internship over two semesters. To graduate, students must pass a comprehensive final examination. Students write a 10-12 page essay based on a prompt or they write a paper on their coursework and internship experience. Nova Southeastern University, founded in 1964, is a private university based in Davie, Florida. The university boasts around 70 online graduate programs spanning accounting, nursing, forensic psychology, and other fields. NSU offers an online MBA program with several focus areas including entrepreneurship, supply chain management, and human resources management. Students pursuing an MBA with a concentration in human resource management take a total of 40-49 credits. Learners complete 22-31 credits of core MBA courses, including financial management, information systems strategy, and marketing. Students with prior business experience may not need to take nine credits of basic classes. Human resources students also complete six concentration-specific courses that deal with areas like talent management and human resource development. NSU delivers the program on campus and online through asynchronous courses. Students may begin the program in August, October, January, March, or May and complete the curriculum in as little as 21 months. Through dual degree options, MBA seekers can pair their master's with a degree in law, psychology, pharmacy, or dental medicine. Applicants need at least a 2.5 overall undergraduate GPA or in their last 60 credits of undergraduate study. Prospective students with a 2.25-2.49 GPA must earn at least a 450 on the GMAT or an equivalent score on the GRE. Applicants from nonregionally accredited schools may qualify if they submit acceptable GRE or GMAT scores. Students can transfer up to two courses of graduate-level study from another regionally accredited university. The University of Denver is a private research institution founded in 1864. The school serves around 12,000 undergraduates and graduates and offers numerous online degrees through its University College. Students can pursue an online master's in strategic human resources with five possible concentrations: HR employment relations, HR management and development, HR operations, human capital in organizations, and learning and development. Regardless of focus area, students complete 12 courses for a total of 48 credits. They take five core courses, four concentration courses, and three electives. One notable core course, human resources across organizations, explores how organizations vary in terms of compensation, size, legal structure, and governmental oversight. Students may choose any electives from the strategic human resources program or other graduate programs. Human resources students complete a capstone requirement through either an interdisciplinary capstone seminar, a capstone seminar, or a capstone project. Students who choose a seminar produce a 7,000-8,000 word paper on a problem in the HR field. For the capstone project, students work with an adviser to craft a thesis-level research paper. Learners complete the entire online master's degree in human resources through asynchronous classes. Students progress through the curriculum in 10-week terms and finish the program in as few as 18 months. DU delivers online courses through Canvas. DU holds approval from the Human Resource Certification Institute. All strategic human resources courses count toward the professional in human resources, senior professional in human resources, and global professional in human resources certifications. Based in Storrs, the University of Connecticut is a public institution in operation since 1881. More than 30,000 students attend UConn's 14 colleges and schools, which offer well over 100 undergraduate and graduate programs. Students at the business school can pursue a hybrid master's program in human resource management. MS in human resource management students take a total of 33 credits. They complete nine core classes in unique courses like business acumen, interpersonal relations, and ethical leadership. While students follow a set course sequence for most of the program, they can choose two electives in human resources or a business-related field. They might choose electives in marketing, finance, or information management. Some notable human resources electives explore consultative management and negotiation strategies. At the end of the program, students complete a human resource management capstone course. Through the course, students learn to identify and evaluate solutions to major human resources problems. They study a human resources business case to describe the issue, detail possible solutions, and propose a plan of action. Students take courses in accelerated, seven-week sessions alongside a cohort. They focus on one course at a time and finish the curriculum in around 20 months. While students can complete most coursework for the master's in human resource management online, they must report to campus for four Saturday seminars each semester. UConn holds in-person seminars at the Graduate Business Learning Center in downtown Hartford. Founded in 1920, the University of St. Francis is a Catholic Franciscan institution that serves just under 4,000 students. USF offers more than 120 online courses and enrolls over 1,500 online students each semester. Distance learners can pursue an online MBA with eight concentrations. Learners pursuing an MBA with a concentration in human resource management complete 36 total credits. They enroll in four MBA core courses, four competency area courses, and four concentration classes. MBA core courses include managerial economics, managerial finance, and managerial accounting. Like many human resources master's programs online, USF's program incorporates classes on talent management, labor law, and instructional design. USF offers the MBA program in a self-paced, asynchronous format. Students can take courses during the fall, spring, and summer semesters and finish the curriculum in as few as 12-18 months. USF delivers many student services online, via email, and over the phone. The Academic Resource Center helps students study for exams and improve their time management and note-taking abilities. Through the Career Success Center, online learners can browse job opportunities and create resumes. Applicants must submit an admission essay, official transcripts, a letter of recommendation, and a resume. They must also demonstrate at least a 2.75 undergraduate GPA and two years of full-time experience in a management position. Admitted students may transfer up to nine credits. The University of West Florida is a Pensacola-based institution with five academic colleges. UWF enrolls nearly 13,000 students through 45 undergraduate programs, 25 master's programs, and specialist and doctoral options. The university offers a fully online MBA program with six emphasis areas. The MBA with an emphasis in human resource management teaches students about the relationship between human resources goals and overall organizational strategy. Students take three human resources courses and nine MBA core courses for a total of 36 credits. Notably, the core curriculum includes an information resource course that introduces the information tools that business professionals use to analyze problems in the workplace. Human resources students choose from a list of concentration courses that deal with topics like recruitment and performance management. UWF administers the online MBA in a cohort-based format. Learners take two classes per term and finish the program at a fixed date. Students without a business background take accelerated business foundations classes to finish the program in two years or less. Prospective students must earn a 450 or higher on the GMAT or an equivalent score on the GRE. They also need a 3.0 overall GPA or a 3.0 GPA in the last 60 hours of undergraduate coursework. UWF considers applicants with a 2.75 GPA or higher who demonstrate at least eight years of professional experience. The university waives the standardized test requirement for students with exceptional grades or significant professional experience. Liberty University is a nonprofit evangelical Christian institution that serves over 100,000 students through more than 550 academic programs. Liberty first introduced online programs in 1985, and students can now choose from more than 250 online programs at the undergraduate and graduate levels. Graduate learners can pursue a fully web-based MBA in human resources. MBA in human resources candidates take 11 core courses and three courses in their concentration area. Some notable core courses include global economic environment, business research methods, and policy and strategy in global competition. Liberty administers the online MBA program asynchronously through Blackboard. Students log in at times convenient for them and meet regularly assigned deadlines. They take courses in eight-week sessions and earn the degree in around two years. Liberty provides numerous online resources to distance learners. Tutors at the Online Writing Center review students' essays and offer feedback. Students can schedule Skype appointments to discuss their drafts in person. The Online Writing Center also offers resources on formatting, style, and citations. Additionally, through Liberty's Supplemental Instruction program, online students can take advantage of live tutoring sessions each week. Prospective students must earn a bachelor's degree from a regionally or nationally accredited school to qualify for admission. They need at least a 3.0 GPA for full admission, but Liberty admits students with lower grades on a provisional basis. Admitted students can transfer up to half of their credit requirements to Liberty. Based in Chicago, Illinois, Lewis University offers well over 100 undergraduate and graduate programs to its 6,500 students. Lewis delivers 19 programs fully online, including an MBA with several concentrations. MBA in human resources students need to complete seven foundation courses, eight core courses, and three concentration classes. Foundation classes include business economics, financial accounting, and current topics in information technology. Students with undergraduate degrees in business may skip some or all foundation courses, so learners complete 36-54 credits depending on their prior business knowledge. Human resources classes cover management, employment law, and organizational development. The program explores business from an international perspective. One interesting core course, international business and the global environment, explores the political, cultural, technological, and economic factors that influence global trade. During the program's capstone class, strategic management in the global environment, students develop strategies and policies for a company operating in the global arena. Lewis administers online courses through Blackboard. Students take classes in an asynchronous and self-paced format through five eight-week sessions each year and finish the program in under two years. Lewis recommends that online learners spend 2-3 hours per week on homework for every class hour. Applicants need at least a 3.0 GPA for full admission, but the school accepts students with a lower GPA on a conditional basis. Prospective students need to submit official transcripts, a resume, and two recommendation forms. Lewis accepts new master's students on a rolling basis. The University of Louisville is a public research institution based in Louisville, Kentucky. The university serves well over 20,000 students through 12 colleges and schools. UofL's College of Education and Human Development offers an online MS in human resources and organization development. The master's program in human resources consists of 33-36 credits, depending on whether students opt for the nonthesis or thesis option. All students take 18 credits of core courses in notable classes like adult and organizational learning, evidence-based research in human resources, and organizational analysis. Online master's in human resources students can choose from three concentration areas. Learners focusing in human resource and organization development explore strategies for running HR departments, setting goals, and implementing employee development programs. Students specializing in health professions education learn to teach and lead in a healthcare environment. The career and technical certification track targets aspiring teachers pursuing certification. Learners can complete the MS in human resources entirely online or through hybrid coursework. Regardless of format, learners must attend live synchronous class sessions each week. Full-time learners spend at least 1.5 years working toward the degree, while part-time students usually complete the curriculum in 2-3 years. Applicants must hold at least a 3.0 overall GPA for unconditional admission. Prospective students with under a 3.0 GPA must also submit GRE scores. UofL requires at least a 146 on the verbal section and a 140 on the quantitative section of the GRE. Additionally, applicants must submit two letters of recommendation and a statement of goals. A member of the University of North Carolina system, Western Carolina University is a public institution in Cullowhee. WCU boasts over 20 online and hybrid programs at the undergraduate, graduate, and certificate levels. The 36-credit online MS in human resources consists of seven required courses and five electives. All courses in the curriculum revolve around four main competencies: relational HR leadership, strategic HR leadership, operational HR leadership, and ethically and socially responsible HR leadership. Students can complete the entire HR curriculum online. Part-time learners who take two courses per term earn their master's degree in as little as two years. WCU's distance learners gain access to online tutoring, library, and career services. Students can take advantage of free online tutoring in business, accounting, math, and other areas. Plus, the online writing center assists students with writing style, citations, and idea development. The Center for Career Development helps distance learners prepare for interviews, write cover letters and resumes, and search for jobs. Applicants to WCU's online master's in human resources program must hold a 3.0 GPA from a fully accredited bachelor's program. They also need to submit three letters of recommendation and official transcripts. Applicants with a GPA lower than 3.25 must submit GRE scores for consideration. Students with a 3.25 or higher can enroll for one semester while preparing to take the GRE. For admission, students need a 150 on the verbal section, a 141 on the quantitative section, and a 3.5 in analytical writing. Matthew Burr founded and manages Burr Consulting, LLC -- a human resource consulting company. Matthew is the continuing education and business administration department liaison at Elmira College, an SHRM certification exam instructor, and a trainer at community colleges and Penn State University. Matthew published his book $74,000 in 24 Months: How I Killed My Student Loans (and You Can Too!) in 2017. Why did you choose to earn a master's degree in human resources? Did this field always interest you? At the time, I was working as an HR generalist for Bombardier Transportation in upstate New York. I had the opportunity to spend time working on a three-month assignment in Toronto, Canada and thought about applying for a senior HR generalist position at the facility. The HR director gave me advice early in my career: In order to move up in the field, you need a master's degree. I took the advice and starting applying to graduate schools, knowing that there was opportunity in the field. I received an acceptance letter to the University of Illinois School of Labor and Employment Relations with a partial scholarship. I also received a scholarship from SHRM. It wasn't a field I was always interested in, but it was the first field I worked in as an intern at Elmira College. I wanted to attend law school but found my way into HR. Why did you choose to concentrate your master's degree in industrial relations? How was it different from a general master's program in human resources? Industrial relations has always fascinated me; working in a foundry as an industrial relations intern as an undergraduate student, it truly piqued my interest. I had the opportunity very early in my career to work in a union shop and go to grievance meetings, mediations, arbitrations, etc. I reviewed labor contracts and knew the language. The top programs in the country are labor schools; industrial relations is the foundation for a great HR education. I focused on labor and employment law, collective bargaining, and dispute resolution as a graduate student. It is different from a regular HR degree because it has that industrial relations component. You have the opportunity to learn from both unions and management. What are some of the most crucial skills you gained in your master's degree program in human resources that apply to your job on a day-to-day basis? I think the labor and employment legal side has truly helped me in my consulting practice. I had the opportunity to take courses in the law school and this prepared me for researching and truly understanding case law and legislation. Not all HR professionals enjoy law, [but] it's a must in this field. The other area is conflict resolution and collective bargaining. I work as an on-call mediator and fact-finder for the Public Employee Relations Board (PERB) for the state of New York. I work with public sector labor unions and management to resolve conflict. This has provided me the opportunity to grow in my career as a mediator and investigator. What was the job search like after completing your master's degree in human resources? Did you feel fully prepared when making the transition from school to the workplace? The job search was relatively easy; the career service office at the School of Labor and Employment Relations was a great resource. I had the opportunity to interview with great companies and had a tremendous internship experience with GE Aviation. During the internship, I had the opportunity to sit at the table as a notetaker during union negotiations. My full-time position I found on LinkedIn. I took a different path than many of my classmates at the school. I found that the opportunity offered a more challenging assignment. I was prepared to make the transition from school to the workplace. I had the experience and knew the field very well. The challenges I face vary [from] day to day. I currently work with 30+ clients on multiple issues. The issues can vary from day to day. I also teach full time at Elmira College as an assistant professor of business administration. I manage many of the standard HR issues: conflict between employees, disciplines, workplace investigations, legal questions, policy questions, compensations, and benefits. I also get involved in more strategy and operations now, with the 12+ years of experience I have. I also focus on training for organizations and local colleges. These trainings provide a tremendous opportunity to answer questions and build relationships. The variety of challenges provides better insights for my clients and it is an enjoyable experience. Why did you decide to open your own consulting firm? I applied to law school in early 2015 and was waitlisted at six schools. At the time, I was in an interim HR director position, doing part-time work as an adjunct professor at a local community college, and had just started working on a few consulting projects. I waited into the summer on law school admissions and I was unsuccessful in being admitted to law school. I put all my eggs in one basket and really had no path forward. After not being accepted, I took a job as an HR business partner at a manufacturing facility in upstate New York. I knew it was not the right path for me and walked away from the job after four days. I took time off toward the end of summer and drove across the country to figure out what I was going to do with my future. On my return trip, I knew this was something I had to try. I recognized that no one in my area was focused on the HR consulting area and knew there was opportunity. I started the business from scratch and just celebrated my third year of growth. What advice would you give to students who are considering a graduate degree in human resources? My advice to anyone going to grad school is to wait a few years and get industry experience. Having 2-3 years of experience on your resume and then going back to graduate school will put you ahead of other people in the program. Look at the best programs and opportunities for career recruiting; the best programs bring in the best companies. My last piece of advice about an HR graduate degree is [to] truly know that HR is a field you want to work in. I've seen people go to graduate school and get a master's degree in HR, [and] six months later they realize they do not want to work in HR. That is why experience before school is the best opportunity to make a great decision. Learn how to network and enjoy the experience. Take advantage of law school opportunities and opportunities to take classes in the business school or other schools. These will pay dividends at the end of the day. In the sections below, we explore components common to human resources master's degree programs. Available degree concentrations, required courses and electives, and the duration of a program vary between schools. This section points out some of the topics to consider as you search for the best program for your academic and career needs. Project managers oversee large and small business projects, ensuring teams of individuals work toward a specific goal and stay on track to meet planned deadlines. In many cases, they are responsible for managing budgets, communicating with upper management or investors, and handling any contractual or legal paperwork involved with the project. Those with a human resources degree with a concentration in recruiting and staffing typically hold positions wherein they interview and hire new employees. These individuals help managers determine the desired employee qualities needed to fill specific roles in the company. In most cases, those in recruiting and staffing positions schedule and manage appointments, file paperwork for background checks and drug screenings, and create advertisements for open positions. Workers with training in this area help determine the best pay and benefits plans for large organizations. They analyze trends and keep track of market conditions and government regulations to ensure their company offers competitive pay and benefits. They may also handle employee retirement plans, wellness programs, insurance claims, and disability policies. These individuals work directly with company employees to ensure they understand how to carry out specific tasks. Training takes place in one-on-one and group settings. Professionals who specialize in training need strong presentation skills and understand the complexities of the learning process. In addition to being able to teach employees about any relevant technology and software, today's training experts must explain topics such as industry standard communication skills, office etiquette, and rules and regulations. Professionals in human resources who specialize in organization development strive to improve company performance by working directly with the workforce. These individuals typically need an understanding of behavioral science-related topics to handle issues in the workplace that may hinder company progress. They also help companies make large transitions, including mergers and moments of significant employee turnover. Individuals who specialize in employment law work with companies to construct fair and up-to-date company policies regarding compensation, company code of ethics, insurance plans, and benefits. These professionals ensure companies stay current with local, state, and federal employment laws. Careers This Concentration Prepares For: Human resources manager or specialist, placement specialist, compliance and reporting analyst. Human Resources Management: Students learn about the role human resources employees play in managing employees and company workforces. This class explores introductory information on diversity training, sexual harassment, cost benefits, and general legal topics commonly encountered in the field. It also exposes students to key HR functions like employee compensation, labor relations, new employee recruitment, and cultivating a progressive and supportive work environment. Ethics: This course examines civil rights and personnel laws. Degree seekers learn to solve or handle issues as they arise in the workplace, including those related to sexual harassment, discrimination, and gender or racial equality. Employee Hiring and Retention: Students learn headhunting techniques to locate the best employees for their companies. They develop interview skills and learn how to evaluate prospective employees' application materials. This course covers the strategic hiring methods that help companies remain stable during moments of uncertainty or transition. Additionally, they learn techniques to help reduce employee turnover and keep a consistent workforce. Organizational Strategy: In this class, students learn how to increase employee productivity by aligning the HR system with organizational objectives. Students explore how to identify and create the best practices for workforce partitioning, value identification, performance variability, and employee impact. They will learn how these techniques help organizations run smoothly and produce positive financial results. Leading Organizational Change: Learners acquire the skills to anticipate, facilitate, and sustain positive changes in organizations. Students learn how to assess the need for alterations in a variety of business scenarios and turn their original ideas into concrete strategies that affect positive change. How Long Does it Take to Get an Online Master's in Human Resources? The length of an online master's in human resources degree can vary. These graduate programs typically require 30-40 semester hours for graduation. Full-time students often complete a master's degree in two years or less. It may take some students longer to finish, depending on how many courses they take per semester, how flexible their schedule is, and what type of graduation requirements exist beyond coursework alone. Some schools require master's students in human resources to write a traditional master's thesis derived from original research. Alternatively, some programs require a capstone or final project. In both cases, students may need several extra months to complete these projects. Another factor that affects the duration of a program is whether the school has a cohort learning or individually paced curriculum. The cohort learning structure involves students working through the same curriculum at the same time on a regular schedule. In many cases, cohort learning has regularly scheduled online or in-person meetings and typically moves at the same rate as a traditional on-campus class. Self-paced courses allow learners to make their way through content at their own rate. Regular deadlines may still exist. The student, however, is often free to learn on their own and interact directly with their professor for all communication. Colleges and universities can earn multiple accreditations, both for the institution itself and for individual departments or degrees programs. The most significant accreditations on the institutional level are regional and national recognition. Credible, career-focused vocational schools that offer a limited number of degrees often have national accreditation. Regional accreditation is the gold standard in higher education in the U.S. and shows that a school meets particular standards of excellence. Sometimes schools have programmatic accreditation for individual departments or degrees. For human resources master's programs, the Association to Advance Collegiate Schools of Business is the primary programmatic accrediting agency. It is important that you attend an accredited school, as it ensures your degree is worth your time and money. Non-accredited schools may offer substandard training and result in credentials that do not advance your career. The Department of Education (ED) is an agency located within the federal government that enforces privacy and civil right laws and presidential policies. While the ED is not directly involved with the accreditation of individual institutions or programs, it determines which private educational associations are reliable authorities on educational quality. The Council for Higher Education Accreditation (CHEA) is a nonprofit, private association that also oversees regionally and nationally accrediting bodies. CHEA is a collective of nearly 3,000 colleges dedicated to upholding high academic standards and provides policy analysis, research, and support for all of its member organizations. Both CHEA and the ED help ensure the quality of education at colleges and universities remains high and improves over time. According to the Bureau of Labor Statistics (BLS), jobs in the human resources field show promising growth. The chart below shows a steady increase in earnings, regardless of position, over the next 20 years. A recent BLS study shows that professionals with a master's degree are likely to earn approximately $12,000 more per year than those with only a bachelor's degree. Furthermore, in addition to job experience, a master's degree may be required to acquire a mid- to upper-level position in the human resources field where the potential for growth and increased earning potential is substantially higher than entry-level jobs. Graduates with a master's degree in human resources often work as recruiting and employee relations managers, staffing managers, trainers, and researchers. Successful professionals in this field have strong leadership skills, communicate effectively with diverse groups of people, and can follow organized, systematic approaches to complete complex tasks. This degree is for students who enjoy working with people and want to see businesses and their employees grow and succeed. These professionals help employees with issues regarding pay, benefits, and retirement. They work one-on-one with employees to ensure they understand medical plans, retirement plans, and any available investment programs. A master's degree makes applicants more competitive in the job market and can be a substitute for any lack of work experience in the HR field. These individuals work directly under the HR manager and focus on a specific role such as compensation, customer service, or recruiting. As the first point of contact for employees, these professionals assist the HR manager with day-to-day tasks and communication. A master's degree helps these professionals develop a more advanced and diverse skill set, making them more valuable employees and increasing their earning potential. These professionals oversee company policies and procedures, and ensure all activities follow local, state, and federal laws. They typically deal with employee situations such as maternity leave, insurance programs, vacation time, and sick leave benefits. A master's degree prepares these individuals to handle such a multifaceted, highly interpersonal, and often high-pressure position. These managers support employees through all types of training scenarios and team-building exercises. They often hold training and session workshops. Alternatively, they work one-on-one with employees, primarily those newly hired, to ensure they understand company policies, equipment, software, and procedures. Making professional connections and learning about different approaches is crucial to your success in HR. Professional organizations offer an entry point for students who want to learn more about their chosen career path. Below you'll find three of the country's most prominent organizations for human resource professionals. These organizations host networking events, provide online trainings, maintain active job boards, and offer other services for career-ready college graduates. Resources like these often prove invaluable as you complete your degree requirements and prepare to enter the job market. Society for Human Resource Management: The largest HR-oriented professional organization, SHRM boasts 285,000 members in 165 different countries. Their website features a vast online resource library, as well as links to continuing education opportunities and an events calendar. National Human Resources Association: Founded in 1951, the NHRA assists aspiring HR employees through networking events, job training, and continuing education. Individual, corporate, and student memberships are all available. Academy of Human Resources Development: This international organization addresses problems and issues in HR using academic research. AHRD's monthly online journal, AHRD Digest, features a publication archive dating back to 2006. Despite the relative affordability of online master's in human resources programs, most students still need financial assistance. Students should complete a Free Application for Federal Student Aid (FAFSA) to learn more about loans, grants, and other opportunities offered through the U.S. government. Additionally, private grants and scholarships are widely available through nonprofit organizations, companies, and other sources. Check out our collection of resources below to learn more about financial aid options. Financial aid for online learning is equivalent to what you'll find for campus-based learning. Learn about the different funding opportunities available to online students. Online programs can provide an affordable and flexible option for women trying to balance the demands of work, family, and school. We've curated a list of valuable scholarships specifically for women. An MBA can prepare you for a wide range of corporate careers, including HR roles. Browse our list of the country's top-ranked online MBA programs. Supply chain management is a field that encompasses the materials, facilities, finances, and information that comprise day-to-day operations for any business or organization. Be sure to check out our ranking of the country's top master's degree programs in supply chain management. Healthcare administrators oversee the daily operations at hospitals, clinics, and other healthcare facilities. This comprehensive list ranks the country's top healthcare administration master's degree programs. Our page dedicated to resources for business students includes links to professional organizations, OpenCourseWare, industry publications, books, and business-minded users to follow on Twitter. Our career page for business degree graduates includes a state-by-state breakdown of business careers and academic options for business students, as well as popular job sites, professional organizations, and continuing education opportunities for established professionals.